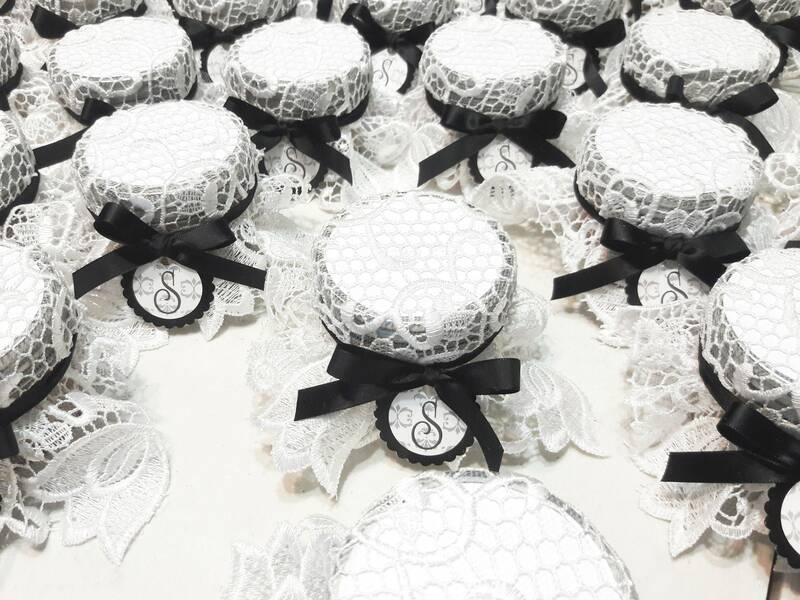 Elegant lace Mini Pie Wedding Favors are an excellent way to thank the guests for attending the shower. 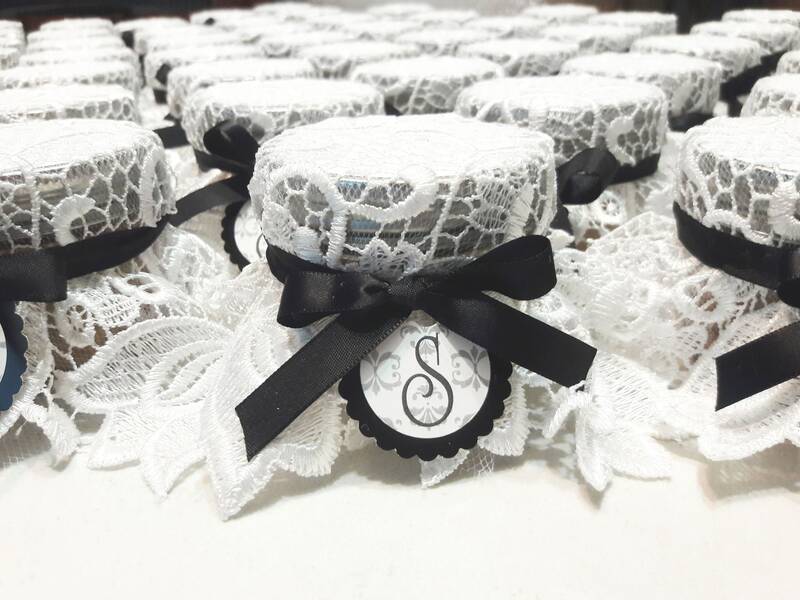 Simply select your satin ribbon & mini pies flavor and you will have a completely customized & fully assembled favor that each of your guests is sure to enjoy! 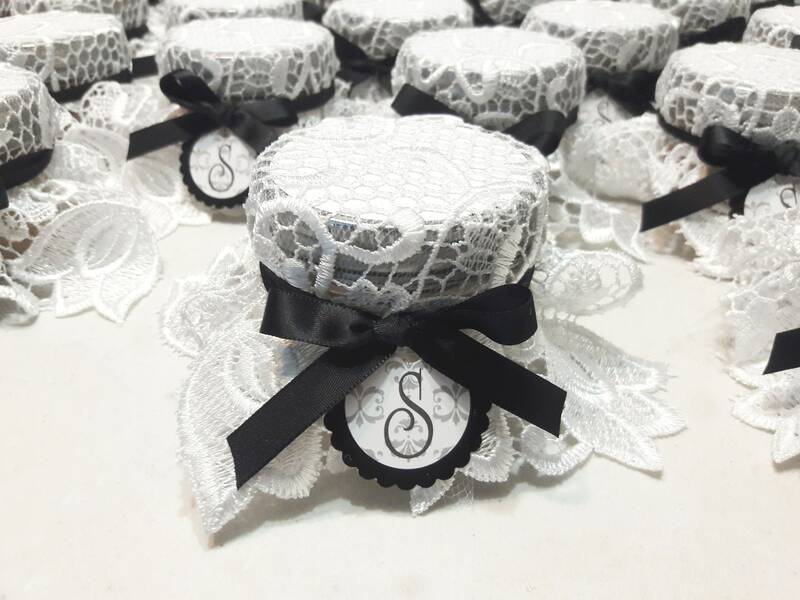 One mini pie of your choice will be placed in a 4 oz mason jar, covered with white lace and tied with satin ribbon of selected color. 24 - pie in the jar favors. When placing your favor order please give us the date of your event in the notes to the seller at checkout. Favor orders should be placed NO LATER than 3 weeks prior to your celebration. ♥♥ PLEASE NOTE: Our products are made in a facility that processes foods that contain wheat (gluten), milk, eggs, soy, peanuts, tree nuts, seeds, and chocolate. While some baked goods may not contain all of these products, trace amounts of them may be found in our products. ♥♥ Let us know if you have any dietary restrictions, allergies or special considerations, and we will do our best to accommodate you. ♥♥ We only ship Monday through Wednesday to ensure freshness. With the exceptions of Holiday shipping policies. ♥ Orders received and payment cleared before 4:00 pm EST on Monday, Tuesday and Wednesday: we will attempt to ship out by Monday of the following week. ♥ Orders received and payment cleared before 4:00 pm EST on Thursday and Friday: we will attempt to ship out by Tuesday of the following week. ♥ Orders received and payment cleared before 4:00 pm EST on Saturday and Sunday: we will attempt to ship out by Wednesday of the following week. ♥♥ GIFT MESSAGE: It's free to include a message to the recipient, please include the details in the "note to seller". We will happily include a handwritten note with your personal message & ship your package to your special person's address. We will send you a delivery confirmation tracking number so that you can track your gift so you will know once it's been delivered. ♥♥ We accept PayPal, credit card payments through etsy's secure checkout system and Etsy Gift Cards. Payment is due within 24 hours of purchase. If we do not receive payment within 24 hours of purchase, we will attempt to contact you. If we still do not hear from you, your order will be cancelled. Request to cancel your order must be sent to us via e-mail within 24 hours of purchase. Rush order is only available time permitting. Additional charge $15.00 plus Express Shipping cost will be added to your order. CONTACT US FIRST BEFORE PURCHASING FOR RUSH ORDER. ♥♥ If you would like an invoice included in your shipped order, please let us know, otherwise all packages will go out without printed invoices in an effort to save paper. ♥♥ We ship with FEDEX/ UPS and occasionally with USPS (especially for smaller orders). We are only able to ship to the 48 contiguous United States, sadly we cannot ship internationally for the time being. Shipping prices only pertained to the 48 contiguous of The United States. Due to international shipping Regulations and the fragility of the baked goods, we are unable to ship to Alaska, Hawaii, Puerto Rico, and Virgin Islands. ♥♥ Estimated delivery time will be approximately 2-5 days (not guaranteed by USPS/FedEx/UPS ground) for most cities in United State. Once shipped, we will send you a tracking number for your package. While Indayani Baked Goods LLC makes every effort to adhere to these guidelines, these Terms and Conditions are in no way a promise or guarantee of delivery time. ♥♥ We bake fresh per order only, therefore we only ship Monday through Wednesday unless otherwise requested, as we want to ensure that your order will not spend unnecessary time at a post office over the weekend, with the exceptions of Holiday and Federal holidays shipping policies . In order to preserve product quality shipments during the summer months, expedited shipping might have to be used for some states (additional charge apply). You will be contacted to see what shipping options apply to your state. ♥♥ We are unable to ship to post office boxes at this time. Your shipping address will be created according to the shipping address provided in Paypal or Etsy invoices. Let us know if you need shipped to different location. If no one is available to receive your order upon arrival at its final destination, our carriers will leave it at the door. If this could pose a problem, we recommend shipping to an address where someone can receive your package. Indayani Baked Goods LLC is not responsible for damage or theft incurred after delivery. ♥♥ Ownership of packages turned over to USPS/Fedex/UPS transfers to the buyer. We are not responsible for lost, held, or damaged packages. We are not responsible for mis-delivery errors via carrier, or incorrect shipping info. Shipping is a service you purchase from USPS/Fedex/UPS along with your order from us, so any shipping issues must be handled by USPS/Fedex/UPS. INSURANCE is available to add to any order, and is recommended for any order you can't afford to lose. ♥♥ EXPEDITED or 1-2 days Express Shipping is available for additional cost. We suggest this option for special custom order and if your shipment is time sensitive. Expedited shipping means you purchase a faster shipping service from the shipping provider, this is NOT a Rush Order, the baked goods will still be shipped per our normal shipping schedule listed in every listings. ♥♥ My baked goods are considered fragile, so any minor breakage or slight crack might happen during long hours of shipping. ♥♥ Combined shipping is only available when all items are shipped to one address. ♥♥ Shipping prices only pertained to the 48 contiguous of The United States. Due to the fragility of the baked goods, we are unable to ship to Alaska, Hawaii, Puerto Rico, and Virgin Islands. Our main goal is to make and keep you, the customer, happy and satisfied. Sometimes things go wrong for any number of reasons and it is at those times we will do whatever is reasonable to make your buying experience a pleasant one. ♥♥ If the package and/or contents are damaged, contact us within 48 hours of receipt, email us a photo of the damage, and we will try our best to resolve the problem. You will be required to ship the item(s) back to us so we can properly investigate the problem. ♥♥ The buyer's cooperation will be necessary for us to receive a refund from the Shipping Agency for damaged or missing goods so we can make a full refund to the buyer. Refund will be issued in accordance with ETSY's and Shipping Agency's refund policies. ♥♥ DISCLAIMERS: Buying means you have read and agreed to our shop policies. 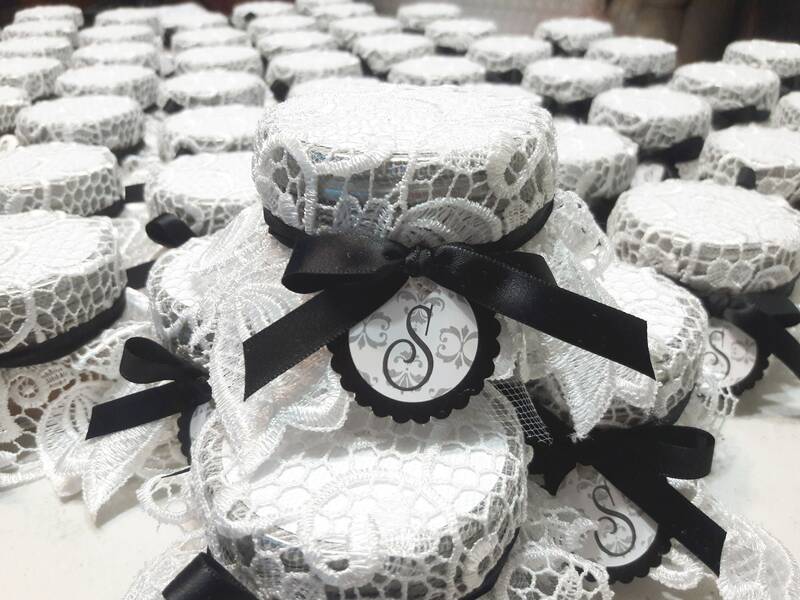 ♥♥ PICTURES: Unless otherwise noted, all accessories (boxes, fresh fruits, whipped cream, flowers, bows etc) used for all of our pictures are for display purposes only and not included as part of the sales. Please let us know if you have any dietary restrictions, allergies or special considerations, and we will do our best to accommodate you. ♥♥ SAMPLES: We do not ship samples, independent of orders. Offering "Free" Samples (and shipping for those samples) merely means that the cost will be absorbed into our product line. We offer an affordable 6 pcs. minimum order, perfect for testing. ♥♥ CUSTOM MACARON COLOR: A minimum of 12 pcs. Macaron order is required for each 1 (one) custom color. ♥♥ SIZE OF BAKED GOODS: We approximate the size of our baked goods because the size of the baked goods during the baking process can sometimes alter somewhat due to certain factors such as hot or cold weather conditions so baked goods may be either a little smaller or larger in size. ♥♥ CHANGES TO AN ORDER: After a custom listing has been created for the total quantity of baked goods you require and purchased, changes to your order cannot be made. ♥♥ CANCELLATION OF AN ORDER/ORDERS PLACED AND PAID FOR: If you wish to cancel an order/orders purchased, and receive a full refund, your order or orders must be cancelled in writing within 24 hours of purchase. 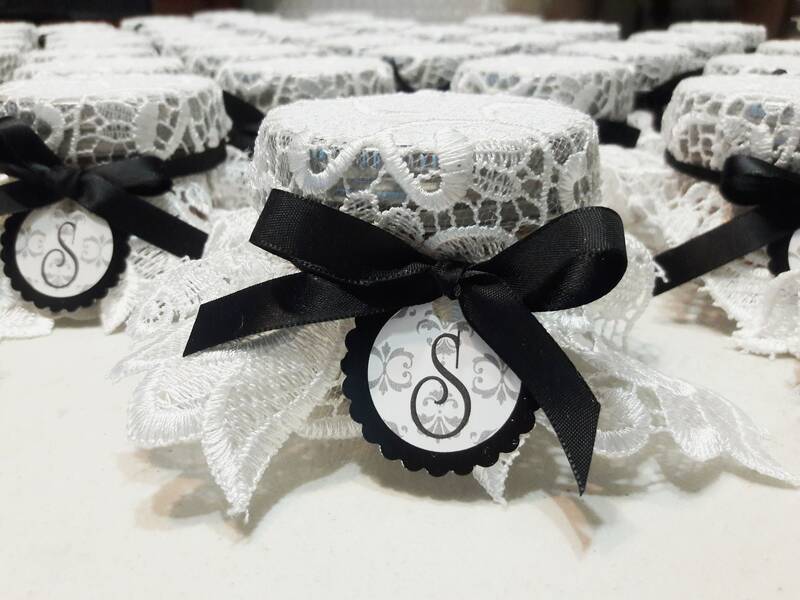 If favor boxes or a custom listing order needs to be cancelled, it must be done no later than 2 weeks prior to the event for a full refund, otherwise we reserve the right to retain partial payment or at least a minimum of 25% of payment to cover purchased supplies for the order. ♥♥ Once received, store your baked goods at room temperature away from direct sunlight. Your baked goods will stay fresh, if kept refrigerated, for around 1 week. Remember, we don’t use preservatives in our products thus they will not stay fresh as long as products that do. .
♥♥ In case we need to reach you, please include your telephone number in your email.